Host & Founding Organization 12447 Mandarin RoadFREE PARKING & SHUTTLESfrom Mandarin Presbyterian Church & Alberts Field JIM REGISTER, AGENT Are you an engaged citizen? If so, how do you know? What de nes an engaged citizen? How do we encourage our children to become engaged citizens? As for myself, I vote. I donate to charities. I even occasionally write a civics article for our community newspaper. But is that it? Do such simple tasks of so little e ort really su ce for me to call self an engaged citizen? Civic engagement is an extremely well researched topic. And yet, answers to such questions as these still tend to evade us. Is the quality or devotedness of citizenship measurable? Well, as it turns out, yes, it is. The National Conference on Citizenship (NCoC) is a leader in documenting the level of involvement of Americans and using that data to promote greater civic involvement. The NCoC has published a Civic Health Index that uses several criteria for measuring our national civic engagement. Additionally, several states, including Florida, have published state civic health indexes. The Florida state report was the product of the Florida Joint Center on Citizenship, a partnership between the Lou Frey Institute of Politics and Government at the University of Central Florida and the Bob Graham Center for Public Service at the University of Florida. These reports provide some interesting and telling stories about just how good (or not so good) we are at one of our most basic responsibilities. According to the NCoC website, the Civic Health Index identi es four separate E Pluribus Unum: Civics for one and allBy James A. Lee, M.Ed., Ed.D. ABD, Peer Teacher Evaluator, St. Johns County School District, jal@rtpublishing.comareas of civic engagement: 1. Electoral engagement. Percentage of eligible United States citizens over 18 years old who were registered to vote in the 2010 elections and percentage turnout among eligible voters in the 2010 elections; 2. Non-electoral political engagement. Percentage who contacted a public o cial and percentage who bought or boycotted a product based on the social values of a company; 3. Group engagement. Percentage who belong to any group, i.e., religious, school, neighborhood or sports/recreation; 4. Community engagement. The percentage who reported undertaking any volunteer activity, percentage attending a public meeting, percentage exchanging favors with neighbors and percentage working with neighbors to  x a problem in the community. The national and state reports survey people of various demographics about their involvement in these areas. The most recent Florida report in 2011 (http://www.ncoc.net/ FLCHI2011) focused on the civic health of Millennials (de ned as those born between 1982 and 1993essentially, those who came of age at the turn of the millennium). Just a few of the interesting  ndings included:  Floridas Millennials have one of the lowest rates (ranked 48th in the nation) of participating in any type of civic, community, school, sports or religious group.  Civic engagement levels of Millennials in Florida are between 7 and 20 percentage points below that of Millennials in the most engaged states in the nation.  Less than half of the Millennial generation in Florida was registered to vote in 2010 and of those who were registered, a little over onein-ve actually voted. You can learn more about how you and your family can improve your civic engagement at: http://www.ncoc.net/ https://www.icivics.org/ http://www.civiced.org/ I Need a Home! 725-8766 Meet Jujubes. I would make an excellent house cat and I enjoy snuggling up on your pillow. My favorite hobby is cuddling and playing with feathers. I have a trained personality and ready to move into my new home! 5 Too busy to stop in? Do it all If Honda makes it... Lou Sobh discounts it! $,Sedan with Automatic, 140-hp 4Cyl. AM/FM CD/MP3, i-MID with 5-Inch LCD Screen, Power Windows, Locks & Mirrors, Side Curtain Air Bags, K eyless Entry, Split Folding Rear Seat, Cruise Control, ABS Brakes & Much More! #DE091279 $ 49 $,Leather Interior! 185-hp 2.4ltr Engine, Manual Transmission, 16-inch Alloys, Auto Climate Control, Rear View Camera, Bluetooth, i-MID Display with 8 Screen, 160 Watt AM/FM/CD/MP3, Full Power Package, Cruise Control, Remote Keyless Entry & Much More! #EA058044 $ 79 Per **Month Per **MonthPer **Month Per **Month Or Only... Or Only...*ALL PRE-OWNED PRICES PLUS TAX, TITLE & DOC FEE. %FINANCING! IN LIEU OF OTHER OFFERS FOR LIMITED TERM ON ALL ADVERTISED MODELS WITH APPROVED CREDIT**New 2013 Civic LX 2011 HyundaiTuscon LTDLeather, Moonroof! BU211869$18,990 2013 ScionFR-S Like New! Sharp!, D2703051 $21,740 2007 LEXUS RX350Loaded, Moonroof! 7003471$15,490 09 MERCURYGrand Marquis LS V8, RWD, Leather, 9X615316 $12,990 Cvt., Extra Clean!, 10202329................$4,995 4 Door, Full Power, 20D02889 ...........$4,995 Leather, 1 Owner, 3X164356 ......$4,995 Full Power, 7 Pass., 5B41789 ..........$6,995 4 Door, Auto, Full Power, 41A50069 .$7,995 AWD Wagon, 1 Own., 47628214 $7,995 Auto, Full Power, 64K, 8L376519 .$8,995 Leather, Moonroof, 6B052404 ......$9,985 Luxury Sedan, 54K! 5FN13504 ........$9,995 Northstar V8 Luxury! 5016118 .................... Sedan, Alloys, Auto, 9H351230 ............ Loaded-up Luxury! 6CK89869 ......................... Automatic, Full Power, BH084077 ..... Spiler, Auto, Full Power, DB049197 ...... Auto, 4cyl., 1 Owner, (U008887 ............... LX, Auto, Full Power, BG082622........... BIG MPGs!, C101765 .............................. Only 18K Miles, Auto, CW270746 ....... XLE 1 Owner., SAVE! PW02221 ................. Leather, HD Tow Pkg. !, CR144666 ........ Like New, Auto, Only 16K!, ENR25740 ............. AWD! Tec & Nav. Pkg., GA000680 ................. Auto, Full Power, BH516368 .................. Only 27K Miles, BA063295 .......... Leather, Moonroof, AA020087 ...... 4 Dr. Auto, Full Power, CA115441 ..... Navi., Leather, Moonroof,9L013417 .. Moonroof, Alloys, BL007082 .................. SAVE BIG!, BL007077 ............................. Leather, Moonroof,BL023239 ............ Rear DVD, AB096354 ....... BARGAINS UNDER $12,999CERTIFIED w/ HONDA WARRANTYSPECIALTY CARS & TRUCKS New 2014 CR-V LXNew 2014 Odyssey** $,** $,FWD with Rear View Camera Plus Automatic, AM/FM/CD/MP3, Power Windows, Locks & Mirrors, Side Curtain Air Bags, Split Folding Rear Seat, Cruise Control, Remote Keyless Entry, ABS Brakes & Much More! #EH510871 LX 7 Passenger with V6 Engine, Back-Up Camera, Automatic, AM/FM CD/ MP3,Power Windows, Locks & Mirrors, 3 Row Side Curtain Air Bags, Split Folding Rear Seat, Cruise Control, Remote Keyless Entry, ABS Brakes & Much More #EB013041 $ 8$ 55 Per **Month Per **Month P **  up to Per **Month New 2013 FitNew 2013 FitW/Automatic! ** $,Five Door, 160-Watt AM/FM CD/MP3, Air Conditioning, Power Windows & Locks, Side Curtain Air Bags, Manual Trans, Split Folding Rear Seat, Cruise Control, Remote Keyless Entry, & Much More #DC079890 160-Watt CD/MP3, Full Power, A/C, Split Folding Rear Seat, Cruise, Keyless Entry, & Much More #DC076496 Not a Penny More! Includes sales tax, tag, title and doc fee! Not a Penny More! Includes sales tax, tag, title and doc fee! Not a Penny More! Includes sales tax, tag, title and doc fee!Per **Month New 2014 Pilot LX** $,8 Passenger 2WD with V6, Back-Up Camera, Automatic, AM/FM CD/ MP3,Power Windows, Locks & Mirrors, 3 Row Side Curtain Air Bags, Split Folding Rear Seat, Cruise Control, Remote Keyless Entry, ABS Brakes & Much More #EB005012 $ 79 Per **Month P **  up to Per **  up to Or Only... Or Only... Or Only... Honda Satellite-Linked Navigation! + Leather, Moonroof, 278 HP V6, Alloy Wheels, Rearview Camera, Bluetooth, 16GB HD, I-Mid, 360-watt AM/FM/CD, Power Heated Front Seats, Steering Wheel-Mounted Controls, & Much More #EA006171 White Orchard Met./Ivory 2014 Accord EX-L V6 $,999 $ 9 Per **Month 2012 KIA Forte EXAuto, Full Power, C5467504 $12,990 up to COURT BIG SAVINGS on Civic, Accord & More! New 2013 Accord LX-S S up to Now! Not a Penny More!#1 New retail Honda sales 20072013 from American Honda Motor Co., Inc.2013 President's Award Winner Your #1 Honda Dealer Has Bracket-Busing, Top-Seeded Deals! As chair of the Justice Appropriations Subcommittee, I have been tasked with the responsibility of overseeing the budget of the largest group of agencies and largest group of state employees in the entire state budget, including the Department of Corrections, Department of Law Enforcement, the court system and the Department of Legal A airs (Attorney General). Last year, our subcommittee proposed a total budget of $4.3 billion which included funding for over 44,410 positions. Last years budget signi cantly reduced a de cit in the Department of Corrections, targeted maintenance issues unmet during the recession and saved millions by taking the clerk of courts out of the budget. Last years proposal not only met the needs of our state, but also exhibited  scal responsibility with a spending reduction from the previous  scal year. We hope to bring to the table this year a similar budget for our state citizens. Looking ahead to this years budget, the legislature is fully committed to funding the states key priorities such as public safety, education, transportation and economic development. I am aware that there will be certain areas of concern in this years budget. Some of these areas that are already on the horizon include early education appropriations, changes in insurance funding, healthcare access and funding, changes in prison population and regulations and juvenile detention shared cost around the state. Along with a budget surplus, Florida House Speaker Will Weatherford and Florida Senate President Don Gaetz recently announced their joint 2014 Work Plan Florida Agenda. Along with numerous proposed policy changes, the plan announced a potential $500 million in tax and fee cuts from a variety of areas in the budget. This would reduce the amount of taxes and fees being collected from Floridians Although there is at times con ict between groups regarding the future of our states budget, I am certain that we all will come together in the end to develop a balanced budget that not only re ects the needs of our state, but delivers a  scally responsible budget to our children to ensure them a brighter future. We must continue to stay true to our  scal principles and budget e ectively to maximize every dollar available. Neuroma Support Group will meet on Saturday, May 3, 2014 at 1:00 p.m. at Mandarin United Methodist Church, located at 11270 San Jose Boulevard. Please call 287-8132 for additional information. The Mandarin Chapter of AARP meets the third Friday of every month at 2:00 p.m. at Augustine Landing, located at 10141 Old St. Augustine Road. We are a non-pro t, nonpartisan membership organization, a liated with the national AARP. Our activities and programs are designed to help people age 50 and over improve the quality of their lives. This months meeting will be held on Friday, April 18 with a guest speaker from The House that Love Built, the Ronald McDonald House. Visitors are welcome! The April general meeting of the All Star Quilters Guild will be held on Monday, April 21 at 9:30 a.m. in the First Christian Church, located at 11924 San Jose Boulevard. There will be an informative program on quilting and Show and Tell of members work. Visitors are welcome. For more information, please contact Dot Butler at 642-6574 or visit www.orgsites.com/ /allstarquiltguild. The Italian American Club is getting many requests for rentals for weddings, anniversaries and birthday parties. We have a new rental agent, Wanda Freay, who will be glad to help you plan your big event. For further information about the club, please call 268-2882 or visit www.iacofjacksonville.com. The club is the best kept secret in Mandarin. Mandarin Garden Clubs annual Garden Festival and Plant Sale will be held on Saturday, April 26 from 8:00 a.m. until 2:00 p.m. at the clubhouse, located at 2892 Loretto Road. Admission is free and there is plenty of parking next door at the Masonic Lodge. Inside the clubhouse will be over owing with a wide selection of reasonably priced plants that grow very well right here in Mandarin. Outside will be vendors selling the most wonderful gardening related items and there will be a barbeque lunch available to purchase. Free co ee and water are available inside the building. Enjoy touring the beautiful garden club grounds that are tended by Duval County Master Gardeners! For additional information, please contact info@mandaringardenclub.org or 268-1192. The Duval County Extension Master Gardeners are o ering Plant Clinics at the following locations on Saturday, March 29, 10:00 a.m. until 2:00 p.m. at Hagan Ace Hardware on San Jose Boulevard, Halls Ace Hardware on San Jose Boulevard and the Lowes Store on Old eld Crossing in Mandarin. They will be answering your gardening questions, giving out gardening publications and accepting soil samples for pH only. If you would like directions on how to take a soil sample, please visit: http://duval.ifas.u .edu/documents/Howtotakeasoiltestsampleweb.pdf. The April meeting of the River City Womens Club will close out this year with the installation of o cers for the coming year. The 10:30 a.m. luncheon meeting will be held at the Mandarin Ramada Inn on Wednesday April 16. Checks will also be presented to representatives for our chosen charities for this year, Safe Harbor Boys Club and the Duval County Council of the PTA Eyeglass Fund for Children. The cost of the luncheon is $16. For reservations, please call 267-8719. For other information, please call 288-0078. The Friends of South Mandarin Library are smelling popcorn! We think a popcorn machine would brighten up the Childrens Department, so we are working on  nding the proper one. Our June Book sale will help fund this project. Mark your calendar for June 21 and 22, for the second annual Book Sale. The group meets on the second Thursday of each month in the library at 2:15 p.m., following the Book Club. Please join us and support your cultural home at South Mandarin Library! The Mandarin Womens Club is fortunate to have as guest speaker at their April 24 luncheon J. Perry Smith, author of the book The Unlikely Priest. Smith is a Vietnam veteran, married and a dad and was a CIA Operations O cer before spending 22 years as an FBI Agent. Later, he was ordained an Episcopal priest and he recently retired after serving  ve years as Canon Pastor at St. Johns Cathedral in Jacksonville. The luncheon will be held at the Ramada Inn Mandarin with the doors opening at 10:30 a.m. The price to attend is $16; reservations are required and can be made by calling Marilyn at 260-8431 by Thursday, April 17. The Mandarin Womens Club is a social club with numerous activities and is open to all women no matter where they live and were always eager to meet new friends! For further information about the club and how to join, please call Diane at 880-5354. Page 8, Mandarin NewsLine  April 2014  www.MandarinNewsLine.com Dr. Bruce SamburskyChiropractic PhysicianOver 25 Years of Experience Sambursky Chiropractic, LLC683-4376 See the Doctor today!Immediate same day appointments available.No Insurance? Cash Discount Program available. 12421 San Jose Blvd. #300 (just North of Sonnys BBQ ) Serving the Mandarin and Julington Creek area. www.backbonejax.com Stop suering from: Now accepting Blue Care HMO! JAX Chamber Annual Trade Show Top 3 Reasons to Exhibit at JAX Chamber Annual Trade Show1. Increase Visibility to Your Targeted Market This event is open to the public. Get your message out there! Reach more than 300 area business professionals, entrepreneurs and community residents. 2. Build Your Prospect List All exhibitors receive a complimentary attendee list and copies of all business cards collected at the door. 3. Obtain a Return on Investment One members $300 investment in a booth resulted in $10,000 contract. March 28, 2014: Deadline to register a booth Call 904.273.5366 | Email : beaches@myjaxchamber.com www.myjaxchamber.comUniversity Center at UNF | 12000 Alumni Dr. Jacksonville, FL 32224Tuesday, April 22, 2014, 5-8 p.m.Sponsors : Business Advantage Magazine | Jacksonville Magazine PRI Productions | YP.com VARSITY INSURANCE, INC. Call 268-6365 Your local independent insurance agent since 2003 You might nd less expensive home insurance . But Tom saved $50,000 on his last storm claim!Dont wait to nd out what you need now but may be missing! Its not easy being green, but Duval County Public Schools has met the challenge and recent state reports indicate it is working! Based on the recently released Florida Department of Education annual District Energy Cost and Plan Maintenance Report, Duval County Public Schools is the third lowest of 67 school districts in the state for energy costs per full time equivalent (FTE) and near the bottom third on cost per square foot. This accomplishment is meaningful and bolsters the 20th largest school district in the nations e orts to promote a culture of conservation within its community of schools and administrative o ces.The North Florida Womens Chorale (NFWC) is now joyfully rehearsing for a concert they are excited to present to audiences in Jacksonville and in St. Augustine in the spring of 2014. The 30-voice chorale, under the direction of Kerry Fradley with Maureen Rhodes accompanying, will perform Chocolates and Other Delights, New Christian business website o ers sneak peekJax Christian Business, who launched their online directory website in December 2013, is hosting a gala event on Tuesday evening, May 6 to o er local business and church leaders a sneak peek at their remodeled design and to raise awareness about how the website can help them increase business and promote their public events. The live web demonstration is the focal point of an evening of music, food, high-end ra e prizes and sponsor showcases. Churches that hold public events and Christian business leaders in every industry are welcome to attend. The demonstration will illustrate features like special o ers, self-managed accounts, a community events calendar, and customer reviews. Jax Christian Business will also reveal plans for monthly events to showcase directory members and provide networking and referral opportunities. The project is headed by Lynn Erhorn, a Christian counselor and life coach with a background in the New York corporate arena. She says, Im passionate about cultivating and preserving a spirit of excellence in each individual I work with. Jax Christian Business gives me the opportunity to do that in the business world and on a much greater scale. Im calling for the community to rally around great customer service and around ethics in business based on biblical principles and devotion to God. She sees the website becoming the place Jacksonville will go  rst to  nd out whats happening in the faith community through the events calendar and to  nd their next hair dresser, real estate agent, doctor or attorney through the directory. Gala sponsors include Gordon Conwell Theological Seminary and 4Rivers Smokehouse and local worship leader Karen Hornsby is among the musical guests. Tickets for the limitedseating event can be purchased at https://jcbgala.eventbrite. com.North Florida Womens Chorale announces spring concert a program celebrating many of lifes simple sweetnesses. It will include songs of the bittersweet, such as Life Has Loveliness, Ubi Caritas and Tiger; and songs of aspects dark and light, such as Nigra Sum, Hot Chocolate and the calypso-esque Buy Me Chocolate. The chorale will  rst perform Chocolates and Other Delights on Sunday, April 27 at 3:00 p.m. at St. Marks Lutheran Church located at 3976 Hendricks Avenue. As part of St. Augustines Romanza Festivale, the chorale will also perform Chocolates and Other Delights on Saturday, May 17 at 12:30 p.m. at Memorial Presbyterian Church located at 32 Sevilla Street in St. Augustine. Both events are free and open to the public. For more information about NFWC, please see our website, www.womenschorale.org.Duval schools earn results that could make some green with envyWe are pleased to see that our conservation e orts and thoughtful planning are reaping positive results, said Superintendent Nikolai P. Vitti. This report shows our e ective management of resources and proactive approach to reducing costs, particularly in energy conservation. It is also rewarding to know that we as a community, including students, are working together to conserve and protect our resources while at the same time, creating a healthier environment for ourselves and future generations. Superintendent Vitti has recommended and the Duval County School Board has approved several energy and water conservation projects starting in the spring of 2012 that have helped achieve these exceptional energy conservation results. These projects possess paybacks of four years or less which e ectively reduces their costs to zero. In 2010, the district founded the Green Champions program as a way to engage school occupants in a district-wide sustainability initiative, The Greening of DCPS. Central o ce personnel reached out to school-based personnel to recruit earth-friendly teachers and sta who would champion green, sustainable practices in their schools. The response was overwhelming and the Green Champions network was established. The program goals are to reduce costs by eliminating waste, conserve natural resources, and incorporate sustainability into the curriculum allowing students to engage in these e orts. The Green Champions program has produced tangible results since its inception. Energy and water consumption have declined by more than 35 percent. Recycling quantities are increasing, and solid waste quantities are decreasing, contributing to cost savings that are redirected to critical district programs. Duval County Public Schools won Floridas Best Green School District Award in 2012 and won Floridas Sustainability Legacy Award in 2013 in recognition of these e orts. The annual District Energy Cost and Plan Maintenance State Report can be found at www. doe.org/edfacil/aemor. asp. Advertise inMandarin NewsLineIts good for business!886-4919There were 2,728 new listings added to inventory in February; an 11.9 percent increase over February 2013. Despite the jump in sellers deciding that now is the time to make their move, overall inventory fell 3.5 percent year over year to come in at 9,324 homes. The reduced inventory equates to just 4.9 months supply. Closed sales increased 1.7 percent year over year, with 1,550 sales taking place in February. The closed sales mix for the month was 851 traditional and 699 lender mediated (45.1 percent lender mediated). Median sales price for all of February sales was $138,743, nudging up slightly from last Februarys $137,050. The median sales price varied markedly between the two sales types, however: $192,750 for tradi-NEFAR releases February 2014 housing sales results tional sales and $76,100 for lender mediated sales. Interest in buying a home continues to be high, indicated by 2,076 pending sales for the month; a 14.1 percent increase over the 1,819 pending sales of February 2013. 2014 NEFAR President Linda McMorrow says, New listings coming onto the market are more traditional sales, less lender mediated. Of the 2,728 new listings in February, just 34.7 percent (946) were lender mediated while 1,782 were traditional. This is positive news that bodes well for Northeast Floridas future. February 2014 real estate sales and activity is available from the Northeast Florida Association of Realtors on NEFAR. com. Time  ies like an arrow. Fruit  ies like a banana. See you at the library in April!Computer Classes at the Library! Join E-library Specialist Donna Peretzman for MS Of ce 2010: Excel 1 at the Mandarin Branch Library on Thursday, April 10 and at the South Mandarin Branch Library on Friday, April 11. MS Of ce 2010: Word II will be offered on Thursday, April 17 at the Mandarin Branch Library and on Friday, April 18 at the South Mandarin Branch Library. No registration is required and all classes begin at 10:15 a.m. Please call 262-5201 (KR) or 288-6385 (SOM) for more information. Page 12, Mandarin NewsLine  April 2014  www.MandarinNewsLine.com Thai Cuisine Noodle House 11701 San Jose Blvd. #28 (904) 701.9090 www.thaicuisine.com Mon-Thurs 11am-9:30pm | Fri 11am-10pm Sat Noon-10pm | Sun Noon-9pm 15% OFF(Dine in and Pick Up) THAI CUISINE & NOODLE HOUSEMust present coupon. Not valis with any other offer.Party Room Available Ask for a VIP Member Card! 1 Hour Custom Facial Only $39(Reg. $65)New Clients Only Gel Polish Mani & PediOnly $35(Reg. $55)New Clients OnlyCome experience the difference. Phuong Spa Room 3956 Sunbeam Rd. #3 Jackconville, FL 32257 www.phuongsparoom.comBY APPOINTMENT ONLY 904.994.3215 With spring and summer fast approaching, this is a great time to consider ways to reduce electric and water utility bills by making your home more energy and water e cient. The Jacksonville Public Library (JPL), JEA and the Green Team Project are partnering to o er free Doit-Yourself Home Energy and Water Evaluation Kits and training workshops at the following library locations: Saturday, April 12, 10:30 a.m.
Webb Wesconnett Regional Library Saturday, June 14, 10:30 a.m.
Highlands Branch Library The Green Team Project is o ering one-hour workshops and demonstrations on the proper use of the kits. The kits will be available for checkout with a JPL library card at each of the workshops and are also available for checkout at any library location throughout the year. The kit tools come in backpacks made locally from recycled billboard vinyl. Developed by JEA, the backpack includes energy e ciency measuring tools to help you conserve energy, identify problem areas in your home and tips on how to  x them. They also include water use evaluation tools to  nd water leaks and estimate your water costs, discover if your faucets and appliances are water e cient and determine if your outdoor irrigation system is watering e ectively. Registration for the workshops is required. Attendance at each workshop is limited to 20 individuals on a  rst-come,  rst-served basis. Slots  ll quickly so early registration is recommended. For more information and to register, please visit www.greenteamproject.org. If you need special accommodations, please contact the Youth Services and Programming O ce at 630-1420 or JPLPrograms@coj.net. Please provide 72 hours notice when requesting accommodations.It is better to offerno excuse than a bad one.~George Washington LEGO Club (Grades K-6) Wed., April 9  3:30 pmSouth Mandarin Branch LibraryCome into the library to play with our LEGO bricks and pieces. We supply the LEGO bricks and fun all you need to bring is your imagination. Page 16, Mandarin NewsLine  April 2014  www.MandarinNewsLine.com Summer Camp & Activities Guide We cordially invite you to attend our Curriculum Day Open House on: Nearly 90% of our preschool graduates are already reading! SIGN LANGUAGE L.E.A.P. INTO FOREIGN LANGUAGES MANNERS MATTE HYSICAL FITNESS PHILANTHROPY FUN WITH PHONICS O O O R R R R R R R R O O E E E E E E E I I I I G G G G G N N L L L A A A A L N N N A A A G G G G N U U A A U N N N N N N N N N N E E E N N R R R E E S S S R R R M M M A A A A M M M T T T T T A A A A T T T T T T E E H H H Y Y Y Y Y H H H S S S S S S Y Y Y Y I I C C A A A A A A C L L A A F F I I T T N N N N N E S S LEARNING EXPERIENCE S S S I I G G N N L L L A A A N N G G U U U A A G G G G E E L L E E ACADEMIC PROGRAM: Parents, Caregivers and Children,Saturday, March 29 is Curriculum Day at The Learning Experience of Mandarin! This special day is a celebration of learning that showcases the important recent advancements in early childhood education and additions to our proprietary L.E.A.P. (Learning Experience Academic Program) Curriculum that has nearly 90% of preschoolers reading by the time they enter kindergarten! As part of this celebration, our center will be having a curriculum-themed open house and conducting VIP tours from 10:00AM to 2:00PM on March 29. Our open house and VIP tours will provide parents and caregivers with an opportunity to experience our state-of-the-art learning center and engage in exciting curriculum and enrichment activities that will help you understand why our programs are crucial for your childs early development. We encourage you to bring family and friends. We hope to see you and your guests for Curriculum Day at The Learning Experience Mandarin! Sincerely, The Learning ExperienceWWW.THELEARNINGEXPERIENCE.COM904-880-169511945 San Jose Blvd. Suite 500 Jacksonville, FL 32223 Saturday, March 29, 10:00AM 2:00PM A limited number of spaces are available at our center for VIP tours. MAKE SURE YOU RESERVE YOUR SPACE TODAY! caring adults, safe places, a healthy start, e ective education and opportunities to help others. Research shows that with these critical supports at home, in school and in the community, children are more likely to achieve academically, socially and civically. For more information about the Jacksonville Summit and to learn how to get involved, please visit coj.net/edsummit. Page 18, Mandarin NewsLine  April 2014  www.MandarinNewsLine.com Summer Camp & Activities Guide NORTHEAST FLORIDACONSERVATORYA non/prot community school of the arts 11363 San Jose Blvd/Bldg. 200 Jax FL 32223 NortheastFloridaCONSERVATORYRichardA.Dickson,President/ExecutiveDirector904.374.8639www.nfconservatory.orgNEConservatoryisanon-profit501(C)(3)Member:NationalGuildforCommunityArtsEducation NortheastFlorida Conservatoryisthe mostcomprehensive musicschoolin ourcommunity. ~PhilipPan, JSYMConcertmaster PrivateLessonsonALL InstrumentsforALLAgesCommunityBand|Orchestra JazzBandFaculty:JSYMMembersandCollegeMusicProfessors PhilanthropicOutreachProjectLearnaboutLAURASFRIENDSatwww.nfconservatory.org. Philip Pan Northeast Florida CONSERVATORY~ Richard A.Dickson, President/Executive Director Philanthropic Outreach Project Accepting New Patients! 8355 Bayberry Road Jacksonville FL 32256 (904) 733-7254Most Insurance Plans Acceptedwww.setzerandcochran.com A TRADITION OF EXCELLENCEJacksonville Youth Soccer Club Summer Camps! SESSION 1 ~ JUNE 9 JUNE 12 SESSION 2 ~ JUNE 23 JUNE 26 SESSION 3 ~ JULY 7 JULY 10 For all sessions (2 options): 9am 12pm (All ages) $119 9am 3pm Extended Day (Ages 8 and up) $149There is a Family discount of $10 for multiple players signed up from one family account Chuck Rogers Park (11950 San Jose Blvd.) To Register: www.JYSC.com or email GordonJYSC@gmail.com eater Dance Camp Voice ~ Drama ~ Dance ~ Costuming Staging & Performing Afternoon & Evening Classes for Young Children, Teens & Adults Available(Across from Care Spot) Y is year we are pleased to oer a Mens Only Ballet Class! is class will be taught by AODs newest teacher Mr. Devon Chanceric. For all the wonderful information and experience Mr. Chanceric will be bringing to AOD, please go to the Our Sta page of our website! Catholic middle school students strive for excellence and this was validated by the results from the Northeast Florida Regional Science and Engineering Fair held on Monday, February 10, 2014 at the Morocco Shrine Center. There The Martin J. Gottlieb Day School has partnered with South African company, Jewish Interactive, to create video games all about the Jewish holiday, Purim. The middle school created several interactive video games over the past  ve months. One was recently selected to be coded by Jewish Interactive and can now be downloaded from the iTunes store. In its  rst two weeks, the app received over 750 downloads. The game, Whack A Haman, was created to make learning about the Jewish holiday Purim fun. Every middle school student learned the steps on how to create a video game from start to  nish. Each student took on jobs such as art director, audio engineer, quality control and project manager. Before the actual game was built, the students had to  rst research Purim and  nd additional facts than they already knew. They had to Students are future scientists and engineersBy Contributing Writer Lizette Woodward, Junior High Science Teacherwere a total of 27 public, private, Catholic middle and Catholic high schools participating in the fair. The Diocese of St. Augustine was well represented with 131 projects out of the total of 402 high school and middle school projects presented at the fair or 32.5 percent of the projects. The middle school students won a combined total of 40 place awards and 25 special awards equaling to about 50 percent of all place awards given at the fair. St. Joseph Catholic School winners included Kaitlyn Devine, in eighth grade, who received a  rst place award for her project in the junior Behavioral Science category; Ethan Hobensack in sixth grade, who received a second place award in the junior Engineering category; Joseph Dray, in seventh grade, who received a fourth place award for his junior Physics project; and  nally, Margaret Gupton, in eighth grade, who received a fourth place award for her project in the junior Medicine and Health category. Congratulations to all the students for their hard work and dedication. Local school partners with South African company to create Purim appBy Contributing Writer Hannah G., Eighth Grader, Martin J. Gottlieb Day Schoolcome up with game concepts and create a storyboard. The students had to write scripts to explain the steps and rules of the game, record sounds and design the graphics. All the steps were prepared on a Google Doc that was shared with Jewish Interactive so that the company could be a part of the process. Students are currently working on the  nal step of their job, which includes marketing their app. They are calling local news stations, tweeting about it on Twitter, creating  yers to advertise the game and brainstorming on additional ways to market the Whack A Haman app. 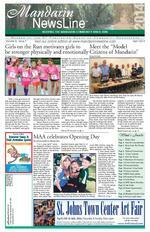 www.MandarinNewsLine.com  April 2014  Mandarin NewsLine, Page 19 Summer Camp & Activities Guide $75 OFF Tuition if you call before 4/30/14. www.ccajax.orgAccredited by FCIS, ACSI, FKC and SACS Christs Church Academy~Inspire, Ignite, Impact~We INSPIRE our students to dig deep into rigorous, college-prep content. We IGNITE a passion for our students to know, think, and do Gods Word. We empower our students to IMPACT our world as they become His hands and feet. Open House & Campus Tours April 4, 9amLearn more and see for yourself! Meet members of our administration and faculty, visit the classrooms, and ask questions. Come see the dierence that is CCA! $25 OFF APPLICATION FEEExpires 4-30-14Christs Church Academy Star ightGYMNASTICSOur #1 Priority: Your Children!Back by popular demand!SUMMER CAMP: June 9 August 15 260 4866www.starlightjax.comConveniently located at the corner of I-295 and San Jose Blvd. 2014-2015 Early Bird Registration$10 OFFApril 28th  May 24th The Best Training at the Guaranteed LOWEST Price. 904-268-207 JAMAKICK.com 12489 San Jose Blvd. Suite 7 (Next to Ace and behind Sonnys) Julington Academy of Martial ArtsSummer CampsFun & Learnin Register NOW e c e r t t t t t t t t t t t t t t s s s s s s s s s s s Once a year band and guard students get the opportunity to show their creative talents and prove their abilities to accomplish their personal style in music and dance. This performance of the PRISM Concert is fast-paced with quick transitions into each performance. This provides students with the ability to perfect their talents on their own by achieving their personal vision. The PRISM concert this year will be held in May. While PRISM gives students a chance to play fun music on his/her own, leadership is about bonding the band to allow it to achieve the highest potential. The importance of developing leadership in our program is necessary in order to continue to o er the students a high quality program. There is a unique and exciting aspect to marching and concert band which young people seldom  nd available to them elsewhere. Each performance is a special opportunity where students experience a sense of community and realize that the sum of who they are is far greater than any one individual. Without this ever being on the curriculum, these young artists are learning how to be team players, how to  t into a community and how Mandarin Band NewsBy Contributing Writers Brooke Sapolsky and Levana Osherto do their fair share by  lling leadership roles in the band program. Our band has leadership roles based on the instrument to o er younger players guidance in perfecting their skills. The program also has several leadership roles such as librarian, historian, tech crew, secretary and the drum majors. These monthly articles are written and/or coordinated by two people in the historian/publisher leadership role. Leadership positions are highly needed in a band to keep the band functioning normally and to teach students how to take control of the program to an extent and create the program thats theirs. Students that desire to be in a leadership role will start attending after school leadership sessions once a week in April to prepare themselves and submit an application for the new season. These sessions will bond the leadership in a way to make the band run as smooth as possible. While Mandarin band excitedly looks forward to a new marching season, it is always good to take a look back. After preparing a few selections of music for about three months, both of Mandarins concert bands preformed a concert for a panel of judges during MPAs or Music Performance Assessments. This concert is meant to give both the musicians and directors feedback on how to improve. As the Mandarin bands took the stage, they sat down ready and determined to play the music the best they possibly could, which they both proceeded to do. While the concerts of both the Symphonic Band and Wind Ensemble demonstrated all of the hard work that was put into the music, there is always room for improvement. As the new marching season is quickly approaching, all of the musicians will continue to look back on this concert to  nd ways to improve.The Mandarin Band section leaders raising the bar: Naomi, Karen, Mark C., Connor, Alex, Jay, Matt and Mark M. Advertise inMandarin NewsLineIts good for business!886-4919 Tell our advertisers you saw them inMandarinNewsLine Support our fine Advertisers! www.MandarinNewsLine.com  April 2014  Mandarin NewsLine, Page 21 Faith News Lenten Easter ScheduleParish Penance Service Thursday, April 3 7:00 p.m.
6:30 p.m. Mass 7:00 p.m.
6:30 p.m. Solemn Liturgical Observance with Holy Communion 7:00 p.m.
Main Church Holy Saturday April 19 Easter Vigil Mass 8:30 p.m.
including weather, charts and safety. While just directing you to the site would satisfy my title, it is actually the use of the online Float Plan that is the topic. I can hear some groans out there from those that just want to have fun on the water, but read on. MHS Sports RoundupFocus on track and eldBy Hazel Odell, MHS Studentof talented and hardworking athletes so that they can earn more points. The camaraderie between the athletes is evident when one visits the track on a given afternoon. The squads warm up, work out and cool down together. Words (and screams) of encouragement are shared. [The throwing squad] welcomed me with open arms; were like a family, said sophomore Madison Thomas, who joined the throwing squad this year. Each team member is more than willing to help somebody with whatever they need. As of Thursday, March 8, the teams have had eight meets, with most of them being at home. Both teams have won the majority of their meets, but they are both working hard to improve upon their weaknesses. As the season moves forward, training to compete at the Gateway Conference Championship becomes stressed. The boys have been champions for the past six years; the girls have been champions for  ve. The meet will take place on Wednesday, April 2 at 1:00 p.m. at Wolfson High School. The teams last non-championship meet of the season, Friday Nite Spikes, will take place at Bartram Trail High School on Friday, April 4, beginning at 4:00 p.m.United States Coast Guard Auxiliary UpdateThe cheapest safety everBy Contributing Writer Ralph Little, Flotilla 14-8Ill direct you to some shortcuts to minimize the agony of another safety step. The plan is your back-up to cheat Murphys Law and Mother Nature and give peace of mind. Left with a friend or authority likely to take action if you are overdue from your fun, it will be the cheapest insurance you ever had. As usual, I ask forgiveness of readers without computer access, but I think my message is for all and non-computer Float Plan forms are to be found. One is in the pamphlet A Boaters Guide to the Federal Requirements for Recreational Boats on pages 69-74. That is available from Auxiliary Vessel Examiners, marinas and marine stores. On the website, navigate (pun intended) from the homepage to Local Boating Info, then to File a Float Plan. All the information you need will open as  oatplancentral and the big green button puts you in the plan itself. Paddlers and  shermen into solo trips or who dont always  nd a pal are probably the most needful of leaving a plan. If I can get over it, so can you. The shortcuts you will want to take are to use the General Purpose Plan and  ll out all the items that dont change, like vessel description, communications, safety equipment on board and most operator and passenger data. Then save the form on your hard drive, leaving only itinerary information and passenger changes to  ll out for each trip. You can then either email it or hand a copy to whoever holds your plan. It is key that the holder will act and be someone like a relative or friend who cant go with you, a marina operator or park authority. The accompanying Boater Emergency Guide helps your holder to begin the search process. Experienced boat operators teach our About Boating Safely course at the Florida Tackle and Gun Club at 9010 San Jose Boulevard. Please call Bob at 721-1346 to reserve a place in the May 17 class or check our website. Let us know about your organization or club!Dont know how to write a press release? No problem. Just write up the:  Who  What  When  Where  Why Send to our Editor: Martie Thompson, editor@mandarinnewsline.com Please give your name and phone number should she need to contact you. She will handle the rest! Can you guess this  sh? One of the most abundant  sheries in North American coastal waters is that of certain  sh that is a favorite for many who  sh our areas of the St. Johns River. This  sh is important commercially with millions of pounds caught annually. This  sh is a fast-growing species reaching maturity in two to three years making it resilient to being over  shed. When mature, this  sh will leave the bays and estuaries it normally inhabits through the warmer months and spend its winter months o shore in the Atlantic. This particular  sh is amongst the  rst of saltwater  sh to be caught every spring for much of the Atlantic Coastal United States. We can expect this  sh to be showing in our local waters now through fall. As the temperature of the water increases, you can expect the quantities and sizes of this  sh to increase also. Being tolerant to a wide range of salinities enables this  sh to endure many of our varying summer and fall weather patterns. Average size of this  sh is about 12 inches long with an average weight of about one to one-and-a-half pounds. In the late summer it is not uncommon to catch these  sh nearly double their average weight. This  sh has a state record of 4 pounds, 15 ounces. The table fare for this  sh is considered very good. Its  avor is often described as light, sweet and pleasant. It can be prepared in any variety of ways as long as it is not eaten raw. The  lets are  rm and pinkish in color and turn white and  akey when cooked. This  sh can be caught from our local piers and docks on the Captain Davids Fishing ReportBy Captain David Lifka river or by boat,  shing holes, ledges, mud bottoms, shell bottoms and bridge pilings. This  sh will bite a large variety of baits including shrimp, worms, clams, crab, cut  sh and squid. A bottom rig with a 1/0 hook on a light to medium rod and reel would be your preferred setup. The end or start of a changing tide is when these  sh seem to bite best, but dont rule them out at any tide or any time of the day. Belonging to the Scaienidae family of  sh, this  sh is kin to more than 270 similar species throughout the world. Chefs often refer to this  sh and its family members under a common, generic and more palatable name: Corvina. This  sh shares one common trait in particular with all of its kinthis is the ability to rub its stomach muscles against its swim bladder, producing a croaking noise. For others in the family, it is more of a drumming sound. Some of this  shs closest cousins are the red drum (red sh), black drum, weak sh and speckled trout, which makes for a pretty decent family line. If you havent guessed by now, this  sh is the most prevalent species in our area of the river, making itself available for us to enjoy by catching and eating for much of the year. Yes, it is the Croaker. Fishing Report: Largemouth peaking for the spring. Ponds, creeks and the river should be producing well with live or arti cial baits. Time to start looking for croaker in the river. This is a good time of year to try worms for bait along with other baits when  shing for them. Whether you catch one, some or none, the family time spent  shing will last a lifetime. and more. As always, I recommend our own Extension Service newsletter, A New Leaf. The March/ April edition is available at http://duval.ifas.u .edu/documents/nleafMarchApril2014.pdf. No computer? No problem. Call 255 7450 and ask to be put on the New Leaf mailing list.A message from the St. Johns River Water Management District...During Daylight Savings Time, residential lawn watering is limited to two days per week:  Homes with odd number addresses: Wed./Sat.  Homes with even number addresses: Thurs./Sun.  Nonresidential properties: Tues./Fri. Water for no more than one hour per zone Water only when needed and not between 10 AM and 4 PMwater lessVisit www. oridaswater.com Be sure to tell our advertisers that you saw their ad in our Home Improvement Guide! www.MandarinNewsLine.com  April 2014  Mandarin NewsLine, Page 25 Our Home Improvement Guide! Contact us today for more information:Susan Penta (904) 868-8986 spenta@landon-homes.net Landon-Homes.Net At Landon Homes, we are condent we can build an exceptional home. Beyond that our goal is to see to it that you enjoy the process, and that your home-building experience will be pleasant and stress free. ats why communication, honesty, integrity and getting it right the rst time are so important to us. We want to create a relationship with you that continues beyond the sale and closing as you continually discover the delights of living in your dream home. e team at Landon Homes consists of dedicated, talented, experienced, highly qualied professionals whose goal is to make your dream come true. Let us show you why that sets us apart from other builders and why choosing Landon Homes is the best decision youll ever make. homesites nestled among the sweeping oak trees dining, shopping, retail, waterways, CRC1326780 Last Chance Only 2 Home Sites Remaining! Tree WorkbyMitch Drake & Sons (904) 703-5040 (904) 287-3819Licensed, Insured & Workmans Comp www.treeworkbymitchdrakeandsons.com 2012 Angies List Super Service Award Over 35 Years Experience | carpet | | wood | | tile | | stone | | laminate | | installs & repairs | | 25+ years of combined experience | | one year warranty on labor | | no subcontractors | A Family-Owned and Operated Flooring and Bath Showroom and Design Center 904-230-0102 www.inspiredoorandbath.com SALE!Free upgraded carpet pad with any purchase and install a 500 sq.ft. or greater. EXP: 4/30/14 Mention this adAccording to the St. Johns River Water Management District (SJRWMD), we are reaching the sustainable limits of our groundwater supplies and must seek other sources, such as the river. One of the major reasons that we are in this predicament is because of how ine ciently we use water. Nearly 50 percent of the water that we use goes on our lawns and plants and about 10 percent of the water used inside our homes is wasted due to leaks. This is the same water that we drink, feeds our wetlands, bubbles up and creates our magni cent springs and provides 20 to 30 percent of the  ow of the St. Johns. By using water more e -Homeowners who want their homes to make strong  rst impressions must prioritize curb appeal. Homes with strong curb appeal sell well and can impart a welcoming feel to all visitors. Improving curb appeal need not be expensive, and the following are a handful of ways to improve the appearance of your home. 1. Install a bold-looking door in a vibrant color or one with a custom design. This helps the home stand out from other properties in the neighborhood. 2. Edge the driveway to create a distinct border between the driveway and the lawn or other landscaping features. This helps homes appear neat and well kept. 3. Use outdoor lighting to make a home more inviting. Outdoor lighting also makes properties safer to traverse at night. 4. Clean a homes exterior to remove mildew or discolorations from the siding, driveway, patio, and other outdoor elements. 5. Improve landscapes with fresh plants and seasonal color. Homeowners without the time to plant can consider container gardens, which dont take much time to assemble but still add appeal to a homes exterior. 6. Prune planting beds and add new mulch to restore color.Helpful irrigation tips to save waterBy Contributing Writer Jimmy Orth, Executive Director, St. Johns RiverkeeperNine ways to improve curb appeal7. Add shutters and accent trim to a homes exterior to improve on the beauty of the house. 8. Install new fencing or give a fresh coat of paint or stain to an existing fence. 9. Replace concrete paths with tile or stone walkways to make entryways more impressive and inviting. ciently, we can save money and prevent the need for expensive and risky plans to siphon water from our river. A recent study found that homeowners can reduce their water consumption by over 30 percent by simply readjusting the automatic irrigation system on a regular basis. The lesson here is dont just set it and forget it. Pay close attention to the weather and rainfall patterns and frequently adjust your irrigation timers accordingly. Often, rainfall can provide all of the water that your lawn and plants need. Also, carefully inspect and adjust your sprayheads on a regular basis, making sure that your sprinklers are not also watering the sidewalks, driveway or street. If you are a JEA customer, you can call (866) 664-8644 to schedule a free water checkup and irrigation audit to improve the e ciency of your system. The type of plants and grasses that we use in our landscaping is another major reason for our wasteful watering practices. By gradually expanding beds with low-maintenance, native plants and reducing the size of our lawns, we can eventually save a tremendous amount of time, money and water. The rule here is right plant, right place. Pick the plants that are the most appropriate for the speci c conditions of your yard (sun or shade, moist or dry soil, etc.) and will require the least amount of water and fertilizer. We also often apply much more water than our plants and grass really need to remain healthy. Over-watering can actually result in a shallow root system, making your lawn less drought-tolerant and more susceptible to weed growth, disease, fungus and insects. Irrigate only when your lawn shows signs of stress from lack of waterwhen the leaf blades begin to fold in half, the lawn turns a bluish-gray color or footprints linger. If you have an irrigation system, consider installing a soil moisture sensor. These inexpensive devices can cut your sprinkler system water usage by more than half by continuously checking soil moisture levels and preventing your sprinklers from operating when watering is not needed. Follow the local irrigation ordinance that only allows watering up to two times a week (March through November) and before 10:00 a.m. and after 4:00 p.m. If your street address is an odd number, watering is allowed on Wednesday and Saturday, while even number addresses can only water on Thursday and Sunday. The days for businesses and non-residential locations are Tuesday and Friday. Finally, consider installing a rain barrel or cistern to conserve water and prevent runo that can wash fertilizers and chemicals down storm drains and into our waterways. By working together to use water more e ciently, we can save money, conserve our groundwater resources, and protect our precious St. Johns River from unnecessary and potentially harmful water withdrawal plans. Learn more at stjohnsriverkeeper.org/river-friendly. Page 26, Mandarin NewsLine  April 2014  www.MandarinNewsLine.com Our Home Improvement Guide! this SEASON904.724.7211 l DAVIDGRAYONLINE.COM SERVICE YOUR SYSTEM *Valid only with coupon. Must be presented to technician at time of service. Discounts and coupons are not valid on warranty work. Not valid with other offers. Expires 4/30/2014 (CAC057180)Any Service Call with Repair*$10off OR SAVE ON A NEW ONE *While supplies last. Ask representative for details. (CAC057180)Our NEW Comfort Lineup to $600 off CR0114 STAY Jacksonville (904) 262-8113 10130 Philips Highway (Across from Avenues Mall, exit 339) Open 7 Days A Week AveLighting.com Clearance100s of Lights, Ceiling Fans, Accessories and Furniture!SPRING %*Off20 60STOREWIDEShop our BIGGEST SALE of the year! HURRY, Quantities Limited *Sale ends March 31. Excludes prior promotions, sale items as marked. In stock items only. re You know spring has sprung when its time for the annual Mandarin Garden Club Garden Festival and Plant Sale. Mark your calendar for Saturday, April 26 from 8:00 a.m. until 2:00 p.m. at 2892 Loretto Road. Admission is free and there is plenty of parking next door at the Masonic Lodge. From beginner gardeners to expert gardeners, you dont want to miss this most popular gardening event. Have you always wanted to start a little butter y garden or expand your existing butter y garden? This is the place to purchase reasonably priced butter y garden plants, see the butter y garden on the garden club grounds and get easy-to-understand expert butter y gardening advice. Have you always wanted to start a charming little antique rose garden in that special sunny spot in your yard or expand your existing rose garden? The easiest to grow antique roses will be available to purchase at a bargain price and garden club ladies will be available to assist you in how to successfully grow antique roses. Native plants are always a popular addition to any garden. You will be able to purchase some of the easiest to grow natives and see how they grow in the native plant garden in front KB Home (NYSE: KBH), one of the nations largest and most recognized homebuilders, continues to expand its new home choices throughout the greater Northeast Florida market with the recent debut of two new communities in Mandarin: Whitmore Oaks and Westberry Manor. We are very excited to introduce these two new communities and provide more opportunities for homeownership to the residents of Mandarin, said Todd Holder, president of KB Homes Jacksonville division. At Whitmore Oaks and Westberry Manor, homebuyers can enjoy the charm of established neighborhoods with convenient access to major job centers while taking advantage of the ability to build a home personalized to meet their lifestyle and budget needs. Single-family homes available at Westberry Manor o er two one-story and  ve two-story  oor plans ranging in size from 2,100 to over 3,500 square feet and include practical design features such as spacious great rooms and expansive kitchens. Westberry Manor is close to area shopping, dining and recreation at nearby Julington Creek and the St. Johns River. KB Homes Whitmore Oaks o ers three one-story and six two-story  oor plans that range from 2,004 to 3,555 square feet, with up to six bedrooms and four baths. Located on Old St. Augustine Road, Whitmore Oaks Mandarin Garden Club newsBy Contributing Writer Susan Westermann, Mandarin Garden Clubof the clubhouse. A wide selection of pass-along plants that all southern gardens should have will be available along with vegetables, herbs, ornamental grasses, shrubs, trees, perennials, annuals, succulents and cacti. Wonderful garden-related vendors will be available to supply you with garden art, handmade herbal soap, unique recycled denim creations, glass totem garden sculptures, life-like hand carved birds and much more. Jacksonvilles own herb expert Linda Cunningham will have at her booth all the very best kinds of herbs to grow. Cunningham not only sells the very best herbs, she can teach you anything you want to know about growing and using herbs. The 65th anniversary Mandarin Garden Club Cookbook will also be available. A wonderful barbeque lunch will be available to purchase, along with delectable homemade sweets made by garden club members. Co ee and water will be available at no charge inside the building. The always knowledgeable and helpful Duval County Master Gardeners will be on hand to help with your gardening questions. The Mandarin Garden Club booth will be available for membership questions and special events building rental questions. The garden club grounds behind the clubhouse will be open for all to enjoy the butter y garden, herb garden, perennial garden, veggie garden, bromeliad garden, native plant garden ornamental grass garden and the childrens Bumblebee Circle Garden. Sit a spell on one of the many garden benched and enjoy the  owers and nature. For additional information, please contact info@mandaringardenclub.org or 268-1192. Good Gardening! It is easy in Mandarin to attract to your yard the Florida state butter y, the Zebra Longwing. One of the plants they love is the beautiful, easy to grow, pass along plant the Firebush. Homebuilder continues to grow in Mandarin area marketo ers easy access to Interstate 95 for quick commutes. Homes at Whitmore Oaks and Westberry Manor start from the mid $200,000s and are available with no community development district fees. KB Home o ers homebuyers the chance to design and customize their homes from  oor plan to structural options through its unique Built to Order approach. Models at Whitmore Oaks and Westberry Manor showcase the various components that can be included in a new KB home such as a covered patio for outdoor entertaining, a master bath with separate tub and shower, and a gourmet kitchen with a double oven and cooktop. Homebuyers are guided by a personal design consultant at the local KB Home Studio to help them build a home that is unique to their style and taste. KB Home has been building in Jacksonville for more than a decade and with the recent openings of Whitmore Oaks and Westberry Manor, the builder has enhanced its presence in the popular Mandarin market. KB Home plans to continue to invest in this area with the upcoming grand opening of another singlefamily community, Abby Glen, on Sunbeam Road this summer. For all your community news!Martie Thompson, Editor editor@mandarinnewsline.com Advertising Sales 886-4919Mandarin NewsLine The third grade students at St. Joseph Catholic School are learning about stars, galaxies and constellations. They researched several websites, read books and used their science notes to learn about these stars. After learning about the constellations, the children then created and even named some new ones! Some of the newly named constellations are: Softy the Teddy Bear, Bumblebee, Hands, Harley the Dog, Chelsea the Cheetah and Shield for Christ.Star Power!